There is often controversy and misconceptions surrounding adoption fees. This fee is often, but not always, necessary. 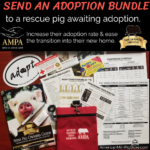 Charging an adoption fee or waiving the fee is a personal choice. Microchips are a common form of permanent identification used for dogs, cats, mini pigs, livestock and small animals. Millions of pets around the world have been microchipped.